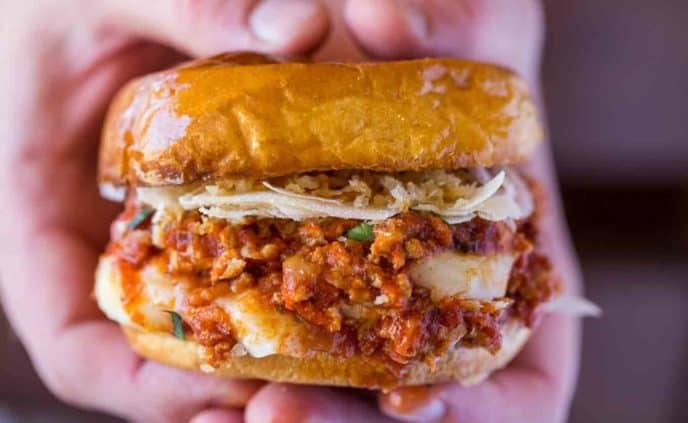 Chicken Parmesan Sloppy Joes have all the flavors of your favorite Chicken Parmesan dish in just 20 minutes and it’s totally kid friendly! 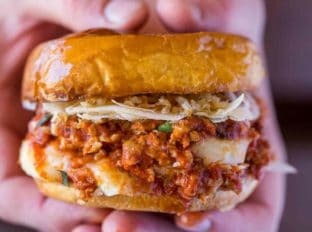 These sloppy joes are not your classic Ultimate Sloppy Joes but they are a delicious sloppy take on classic Chicken Parmesan and I can promise you they’re DELICIOUS! 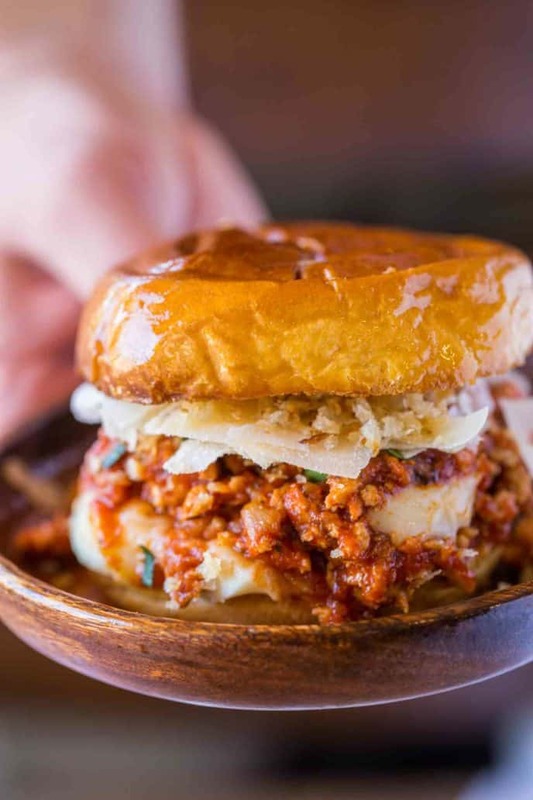 Another Monday another Sloppy Joes Recipe! 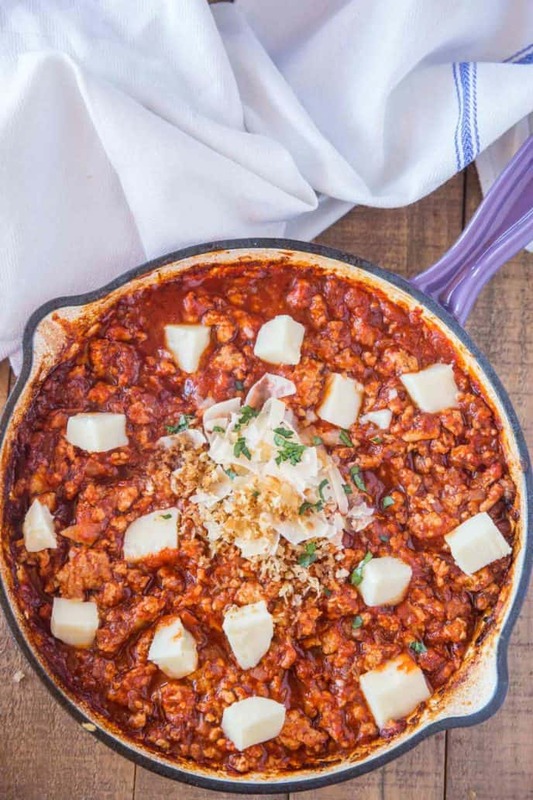 We’ve started using much more ground meat since experimenting with all these easy sloppy joes recipes and we decided to make a concerted effort to use more white meat in our recipes. So of course one of the first things I did was search the site and scroll through all the chicken recipes. 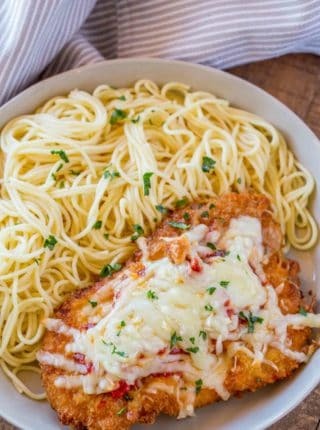 Well, lo and behold chicken parm was one of the most popular recipes on the site! 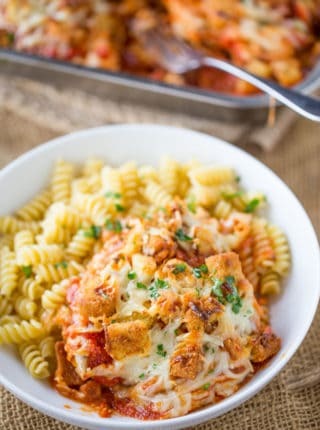 In fact even the Chicken Parmesan Casserole I made with the secret crunchy ingredient is in the top 50 on the site. So of course we started testing recipes. I needed the creamy parmesan to stay chunkier instead of disappearing into the mixture. I needed a crispy rich crunch and while the bun was a fine enough “breading” the toasted panko was by far the taste testers favorite option. Last but not least the Parmesan cheese was a no brainer, we LOVE shaved parmesan in our house. The end result? We have made this recipe 1x a month since we first tested it almost six months ago. It’s a verified hit. In most of my sloppy joes recipes I try to hide vegetables in the recipe so I feel like a better parent (my working mom guilt is real). WHAT GOES GOOD WITH Chicken Parmesan SLOPPY JOES FOR A SIDE DISH? 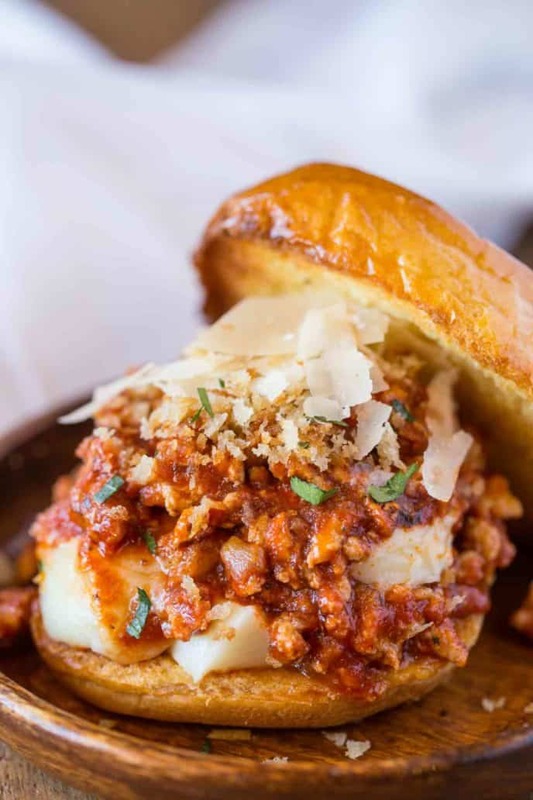 These Chicken Parmesan Sloppy Joes are perfect served with a caesar salad and steamed broccoli and carrots. Toast the panko while the chicken mixture is reducing. Stop cooking when its just slightly too wet still, it will thicken as it sits for a couple minutes. Add the mozzarella chunks at the very end of cooking and don’t stir because the cheese will mix into the mixture too much. Are you going to join us and enjoy this recipe on Wednesday? Remember if you make this dish this Wednesday, we’ll be having the same dinner. We put a ton of effort into recipe testing almost 40 Sloppy Joes for this weekly series! Chicken Parmesan Sloppy Joes have all the flavors of your favorite Chicken Parmesan dish in just 20 minutes and it's totally kid friendly! Add the canola oil, chicken and onions to a large skillet on medium high heat breaking it apart but leaving some chunks about the size of a raspberry or small grape (don't crush the heck out of it, the larger crumbles will help give the sandwich stability). 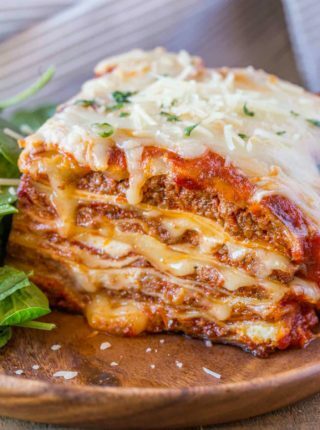 Cook until well browned (5-6 minutes), then add in the tomato sauce, tomato paste, and Italian seasoning and continue cooking until the sauce starts to evaporate and the mixture becomes "sloppy" (about 5-6 minutes). In a smaller skillet add the olive oil on medium high heat then add in the panko stirring until it starts to toast (about 1-2 minutes) then remove from the pan into a bowl to stop the cooking. When the sauce is reduced top with mozzarella chunks. Toast the buns then spoon over the chicken and cheese mixture, top with parmesan cheese and toasted panko. This was a huge hit in our house; which isn’t often the case with meals. Would this freeze well? This looks like something my family will absolutely love! Hi, I have chicken already cooked would this turn out the same way? Yes, just add in the cooked chicken once the onions are browned. Enjoy! I love this idea! My mouth is watering! What an awesome twist on a yummy meal! I absolutely have to try this! 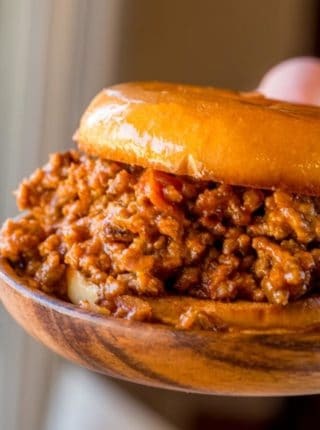 I don’t usually like sloppy joes but I would totally try these! Yum!